Welcoming and radiant, this three bedroom two bathroom century old farmhouse combines the charm of its history with modern and eclectic comforts. Secluded but only a short distance to all amenities. Spend your time relaxing on the porch with sweeping ocean views, exploring local wineries, watching for whales from the shore or strolling to one of various local beaches. Unwind at the end of a long day in comfort as you put on a record and plan your next day's adventures! Shanta and Bari bought this property in 2016 but have been renting it for years before then. Shanta fell in love with the island in 2000 and was able to buy the adjacent piece of land. She spent the next few years building the small "shack" by the ocean by hand and with the large support of the amazing community around there who would stop in to check on her progress. Since then, she's been living in Philadelphia and gets there as often as vacation schedules allow. When she met Bari and they had their son, Leo, the game changed and they needed a place that was more than glorified camping. Bari has become equally enamored. We've had friends and family and others up to enjoy this amazing piece of land and the adjacent communities. It's hard to resist. We hope you'll enjoy. The property has an amazing history. It was built in the late 1800s and was once part of the expansive Buell homesteads. The family still resides in the area and are neighbors who have so many amazing stories about the land and the ways of the island. We would not be there without their ongoing friendships. Every year we learn more about the history of the property. It's dotted with old farm equipment; horse/human powered; the chestnut tree in the yard was planted in the 1950s to celebrate the return of a family son/soldier from the war; the remaining outbuildings were once a gardening shed and the tractor shed; the old barn was burned down after the roof fell in, which re-naturalized the plantings; you can also see the foundations of the old buildings at certain angles. Shanta's favorite thing: there is an old law that allows fisherman to access the first 20 feet of the shore to spread out their nets. And so, our neighbor has been carving a walking path along several properties so that we all have a little private "fishermans" walk. The view is one of the best on the island. When people decide to settle here, they choose this community because of the amazing people, the various beaches (secluded or public as you choose), and the unparalleled view. An amazing spot on the ocean. We like to watch the whales and other sea life go by. Please contact us for more instructions if you want to turn heat on. It works well but we turn it off for the summer. Yes. But, no dryer. We have a super efficient clothesline (if it's not raining). Can be spotty on occasion; wifi code available near entry board. There is one, but we ask guests not to use it. Stove lights with a lighter (provided). Let us know if you want the highchair moved into the house for your visit. We have a portable Bluetooth speaker available. If charging needed, a charger is available near the entryway/welcome board. DVD player connected to tv in upstairs bedroom. Rent movies at local libraries or at Winds Gas Station (a pretty large selection). Take a book, leave a book. Many books on island life and local attractions. Vinyl records provided for your listening pleasure. well maintained. lots of plants and flowers. please advise if you want access. We have 2 available and an air pump if air is needed in the shed. small deck/patio with lobster trap porch couch and tables. skim boards, boogie board, goggles, clam rake, all in shed. Please watch your head (low header) when you enter. We came for a getaway and were able to walk down the grass path to the ocean shore, watch the sunsets. I finished a novel and was DELIGHTED to find that art supplies are provided, so worked on a painting-- my 2 favorite things to do which i rarely have time for. My husband caught up on reports for work a little each day, and we'd enjoy a seafood dinner together. Visited several historic lighthouses and shopped and dined in Charlottetown which was about 40 minutes away. This home is in a rural location; it was a pleasure to sit in the window seat or have a bubble bath in the clawfoot tub upstairs without any disturbances, and our stay relaxed and refreshed us so that by the end of the week we were fortified to return to normal life! 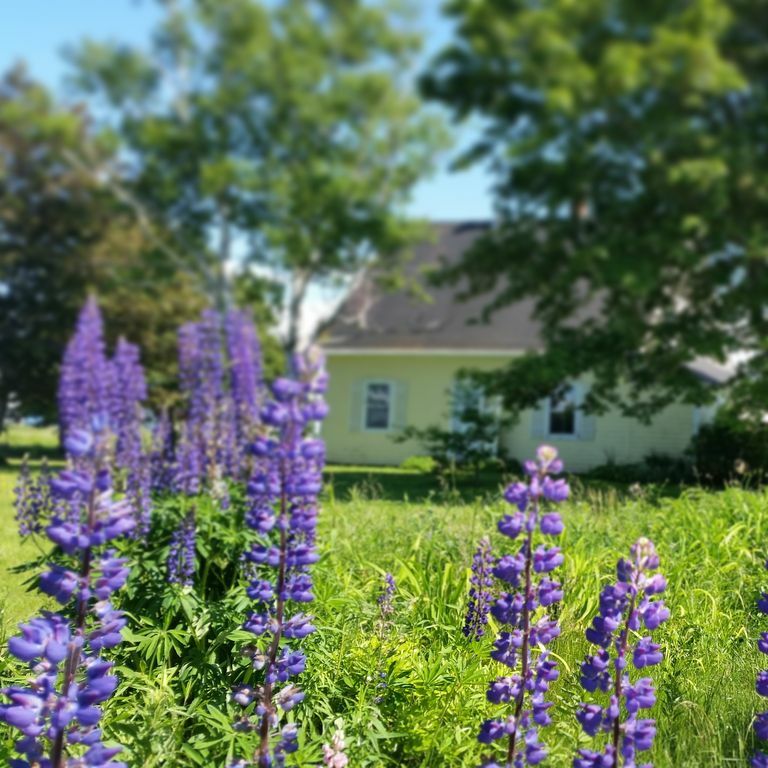 From the serene coastal farmland setting to the out of the way, non-touristy Points East location to the comfortable and welcoming style, this place is a true PEI gem. Such a great place to get away from it all and just enjoy the peace, beauty and freshest air. It’s easy to just stay put and relax. And with art supplies provided and a fun LP collection you can get lost in simple pleasures. Not to mention the starry sky and footed tub with an ocean view! Exploring the local area, we found uncrowded beaches covered in shells, amazing chowder and seafood close by and some of the island’s favourite lighthouses. This is the place to come to escape from big city madness and remember what matters. We will come again for sure! Beautiful property and home, peaceful and charming! Loved this farm house and all of its charm--the art, the comfy sitting spaces, the record collection, the spacious kitchen and dining room. My five-year-old son loved playing on the swing, climbing the trees, exploring the yard, drawing on the chalkboard, and having a bubble bath in the claw-foot tub. It was a perfect home-base for our stay in PEI, and we were able to easily drive to local beaches, coffee shops, the winery down the road, lighthouses, and island attractions. The welcome package provided by the host offered great recommendations (e.g. dinner at Point Prim Chowder House was amazing and definitely a must!) and both Shanta (our host) and Debbie (the person who helps with cleaning) were easily reached by text/phone to answer our simple questions. Highly recommend this peaceful spot. This is a great farmhouse in a perfect location for touring in a quiet part of PEI. There are some tasty restaurants in the area, great beaches and a couple of lighthouses in the area. We stayed 4 nights at this place. Nice ocean view. Lots of spaces inside and outside. We thoroughly enjoyed during the stay. Mosquito visited after sun set most frequently and entertained us. LOL. We so enjoyed our stay here. The accommodations were comfy, the view of the ocean fantastic, but most importantly it was quiet. We were looking for a way to get away from everyone and this place did the trick. Far enough away for peace, but close enough to restaurants and attractions so we didn’t feel isolated. The home was clean and nicely decorated. Thank you Shanta for sharing your lovely home with us. I loved playing the old records, brought me back to my youth 💗�.